About 70 mm from snout to base of tail. It’s that time of year again, when some animals just can’t help themselves. Quite a few people living in the Ranges will be familiar with this little marsupial, the Agile Antechinus (Antechinus agilis). They are very active at this time of year preparing for their breeding season. As their names suggests, they are very agile and accomplished climbers, and inquisitive too. They are nocturnal and forage among forest litter and on tree trunks for a variety of invertebrate prey; mainly beetles, spiders, cockroaches and insect larvae – look at those whiskers for getting around in the dark! The smallest crack under a rafter, or between the lining boards will give them access to your house, which is where most people encounter them. 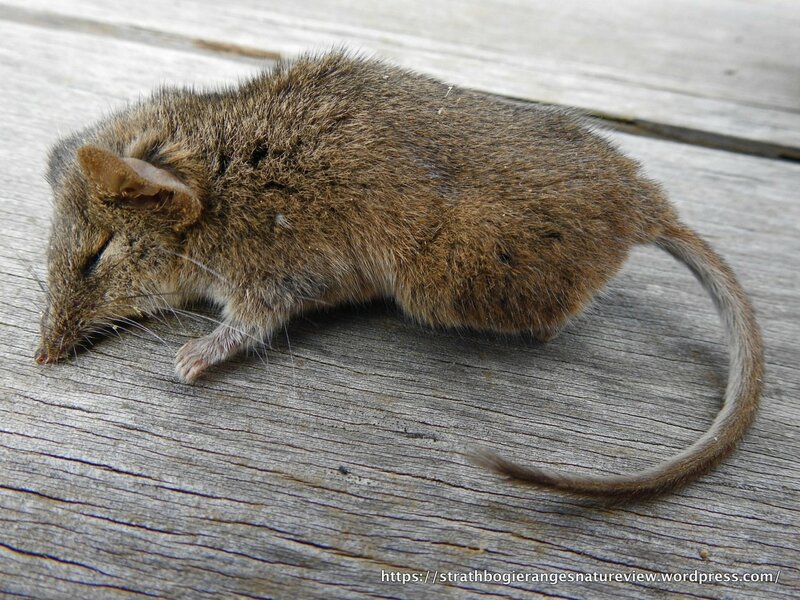 Though a little larger than House Mice, they are often confused with mice … and sadly suffer the consequences – SNAP. They’re also similar the closely related Yellow-footed Antechinus found in drier forests and woodlands surrounding the Strathbogies. Long whiskers and big ears help Antechinus sense their surroundings. Scrotum clearly visible between the hind legs. Thick body fur helps keep these fellows warm all through the cold Strathbogie winter. Broad soles, ridged pads and small, pointy claws – great climbing equipment. Mating is highly synchronous and occurs in a two-week period in August-September and all females within a population give birth within a couple of days of each other. Then, with their work of fertilizing the females complete, all males die within the next week to ten days (of stress-related conditions), leaving the Agile Antechinus populations all over Australia composed entirely of adult females, until those females give birth to 6 to 10 young about one month later, in September-October. Some females may live to breed the next season, if they don’t fall prey to owls and other predators. A hectic lifestyle indeed! The crack in this Narrow-leaf Peppermint is a perfect Antechinus home. Even using them for nesting. Thank you for the informative article & photos! I worry that I will mistakenly kill an antechinus with mouse baits, etc. At least I know more now & will do my best to recognise the difference between the two species! I appreciated the detailed notes about this delightful creature. Thankyou.